I am a registered midwife with over 20 years experience of caring for women and babies in both the NHS and private sector. 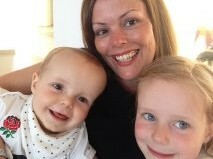 I am also a Certified Infant Massage and Baby Yoga Instructor, music and movement teacher and most importantly a mum! In 2011, I gave birth to my first little bundle of joy Robyn. Like all mums to be, I spent months preparing for the arrival of my first baby. I was ready to become a parent… or so I thought. I found having a baby to be a magical time, but it was also exhausting, emotional, stressful and completely overwhelming… without doubt the hardest job I have ever done. My experience as a new mum made me even more passionate about supporting other parents through pregnancy and the early days of parenthood, and as a result Bump Baby and Beyond was born. I designed the antenatal classes to offer the perfect balance between meeting the expectations and hopes of parents approaching birth with the reality of common experiences, to enable them to be informed and to feel confident during such a special time in their lives. My years of providing care for women during pregnancy, birth and the postnatal period ensure that I have both the knowledge and experience to support and prepare parents for the arrival of their baby. The baby groups and classes offer parents a chance to meet friends who are experiencing exactly the same problems and emotions as them, at exactly the same time. Parents can speak openly and honestly in a supportive environment, whilst having great fun with their babies, whether its massaging, moving or singing! Cake, coffee and cuddles are always at hand! In 2014 I gave birth to my second baby Oliver, and Jenny came on board to become the second member of the Bump Baby and Beyond team. We now teach classes 5 days a week and are excited about what the future holds! I wholeheartedly believe that both our pregnancy and baby classes are the best that you will find. They provide a safe haven for parents and babies to come to and feel comfortable, relaxed and supported. They are informative, honest and great fun, and can provide a time in the week that you can spend with other parents, making great friends who are going through very similar experiences and emotions. My career working with mums and babies started over 20 years ago working as a midwife within the NHS. In 2008 following a cycle of IVF I became a mum to twins Molly and Jack. I found becoming a mum a huge rollercoaster of emotions, I was so in love with these 2 little people but I was also apprehensive, worried, scared and felt that I had lost control. It took me a long time to ‘find my feet’ as a mummy. Going through this gave me a real passion for being honest about being a new mum, for encouraging women to support each other, not judge each other, laugh with each other and acknowledge that although this is an awesome and fulfilling role, it is perfectly normal and ok to feel overwhelmed, anxious, and a million other things a million times a day. This passion has led me to becoming a baby massage, yoga and twinkle toes teacher and along with Linzy we aim to ensure that our classes are relaxed, friendly, and a safe supportive place where any questions big or small can be asked, any worries chatted about and any triumphs celebrated. From the gentleness of baby massage, the first rolls and giggles on baby yoga and the excitement of twinkle toes , I truly believe that our experience as midwives, teachers and especially mums allow us to achieve this. Through our classes I hope to provide an ear to listen, a shoulder to cry on, and a support network- hopefully making the transition to parenthood a little easier. Spending a day singing, massaging, moving and having fun with babies and their families makes me feel that I have the best job in the world! I have been working with babies, children and their families for 19 years. I graduated with a degree in Care and Education of Young Children and went into nursery management, and then working with Barnardo’s for 9 years. I find supporting and encouraging parents and children such a rewarding and privilege. I had my beautiful daughter in 2011 and quickly realised that motherhood was more challenging than I expected. Most of my friends didn’t have children at that point so at times I found it very isolating. I booked onto a local baby massage class as a way of meeting other new Mums as well as doing something that Grace and I could enjoy together. I have made lifelong friends through these baby massage classes and we continue to support, rant and cry with each other all these years later. In 2014 I had my lovely Thomas and after maternity leave, handed in my notice. As rewarding as it is my two beautiful children keep me on my toes.